The formation of The Band of Heathens is as natural and organic as the music they create. 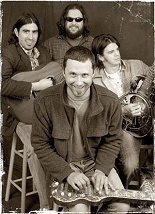 In early spring 2006, the three principle songwriters, Colin Brooks, Ed Jurdi and Gordy Quist, were sharing the bill every Wednesday night at the venerable Austin club Momo's. Originally, it started as each songwriter performing his own set. But in a short time they started sharing the stage equally and collaborating on each other's songs, with bassist Seth Whitney as the anchor of the rhythm section. The Wednesday night series was billed as"The Good Time Supper Club." Largely improvised and unrehearsed, the shows quickly gained in popularity and word spread throughout Austin that if you wanted live music on Wednesday night, Momo's was the place to be. A misprint in a local paper billed the act as "The Heathens." The moniker stuck and soon The Band of Heathens began to cultivate a loyal and growing legion of fans that immediately took to the expert musicianship, the finely-crafted songs and the band's distinct quality of having three front men, each one of whom sings, writes and plays lead guitar. In March 2007, drummer John Chipman joined the band and helped fortify their country-soul-rock-and-roll sound. 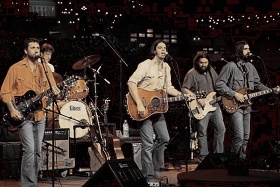 In May 2006, The Band of Heathens teamed up with the Austin label Fat Caddy Records to record two Wednesday nights as a snapshot of the scene at Momo's. In October 2006, the critically acclaimed Live from Momo's was released to the public. Live records normally don't get the attention and airplay that studio efforts do, but with Live from Momo's, program directors, club owners and media around the country started to take notice of this upstart Austin band. Word was spreading about their legendary live shows, and the crowds continued to grow at both their Wednesday night residency and on tour. During 2007's South By Southwest Conference, the band members were invited to attend the Austin Music Awards ceremony at the Austin Convention Center. That night The Band of Heathens accepted the award for "Best New Band" as well as runners-up awards for "Band of the Year," "Album of the Year," "Song of the Year," "Best Record Producer" and others. Individually, members of the band were also recognized by the Austin music community as nominees for "Musician of the Year,""Best Male Vocalist," "Best Bass Guitar" and "Best Acoustic Guitar." Band member Gordy Quist explains that the Austin Music Awards verified what others had seen, but the band's members hadn't caught on to. "We thought of it as a side project for a long time," he relates. "Eventually, it got to a point where the chemistry was undeniable, and we were having such a good time with it, that evolved into a band." Colin Brooks adds, "To be embraced like that by Austin was astounding. I certainly feel more at home in this band now, and that includes my own band, than I have in any other band." While appreciative of the award, Ed Jurdi may be the voice of reason among them. "I'm not sure winning the award made much of a difference," he asserts. "What we're experiencing just may be a natural progression, in terms of songwriting and arranging for the band." The "Best New Band" from Austin, TX spent the rest of 2007 living up to that accolade and acting as defacto ambassadors for the "Live Music Capital of the World" with extensive touring throughout Texas, New Mexico, Colorado, Utah, Mississippi, Georgia and Louisiana. Word spread quickly about this traveling band of minstrels and as the fan base grew, people took notice. A by-product of that touring and growth was a live DVD recording project proposed by M.E. TV, Austin's music television station. The station was looking to capture one of Austin's finest up-and-coming bands, and on June 1, 2007, at the legendary Antone's nightclub, they got what they were looking for. It's rare for a band's first two releases to be live recordings, but then there's nothing typical about The Band of Heathens. Live at Antone's - simultaneously released on DVD and CD in January 2008 – has furthered the buzz and acclaim about both the band and their live shows. Regarding the DVD, Krystal Halfmann from LoneStarMusic Magazine writes, "The Band of Heathens were 'on' that night and thankfully, the quality of the recording lets that detail shine through. The extraordinary appeal of the Live at Antone's records is that it showcases The Band of Heathens' main asset, the fact that every one of them is so freakin' gifted. Not many acts can pull off having three frontmen and three songwriters, but each band member's talent and style meld together seamlessly." When The Band of Heathens finally entered the studio to record their long-awaited debut studio effort, they assembled a collection of their best songs, employed the legendary songwriter Ray Wylie Hubbard to produce and called on a few special guests (Patty Griffin, Gurf Morlix, Stephen Bruton) to help out. The final product is a self-titled, polished studio debut that is sure to be on many "Best of" lists for 2008. 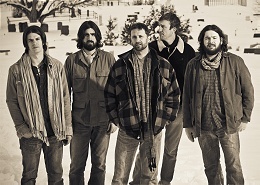 With a world-class recording, The Band of Heathens decided to bring on a team of high-caliber music industry pros to promote and distribute the release nationally. They include: Al Moss of Al Moss Promotions (The Flatlanders, Delbert McClinton, Steve Earle) at the helm for Americana Radio, Clay Neuman of APEX for Texas Radio, Lindsay Reid of Reid Promotions for Triple-A radio, Kissy Black and Lotos Nile Media (Blue Highway, John Prine, Stoll Vaughan) for publicity, and Alexis Kelley of Livewire Entertainment as retail marketing and sales liaison. The band also signed with Third Coast Artists Agency for booking representation. 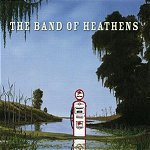 Scheduled for a May 20, 2008 release, The Band of Heathens will be released on BOH Records, a label started by the band, and will be distributed nationally through Burnside Distribution. With a new release out in May, the band will be touring extensively this year; expanding their existing markets and entering into new key regions. The excitement that Austin shared with the band at the very beginning is being felt in places like Denver, Nashville, Atlanta and beyond. The band has been approached about touring with some of the top names in alt-country, and the level of interest from both industry insiders and fans is steadily growing. They will continue to bring their unique brand of Texas twang and country soul to anyone who is curious, willing to listen and hungry for the American rock 'n' roll that The Band of Heathens deliver. Also in 2008, Edgar Heckmann from Bluerose Records Germany noticed the band while staying in Texas and spontaneously signed a contract for the European distribution. Not only that, he also arranged the first 4 gigs at the end of 2008 in Germany. The feedback was so amazing that the Band of Heathens returned a couple of weeks later (Feb 2009) as well as early summer (May/June) with additional shows in Great Britain and The Netherlands. And in October 2009 the band returned again to perform again on stage in Germany, Great Britain and the Netherlands bringing along their new studio production-CD "One Foot In The Ether". And they were playing a special gig at Rockpalast where so many artists started an international career. On November 27, 2009 The Band of Heathens will play a special "4th Anniversary Show" at the Momo's Club in Austin TX, back to where it all began 4 years ago! At the end of 2011 Colin Brooks decided to leave the band - in early 2012 Seth Whitney and John Chipman left as well - all three were replaced by Trevor Nealon (keys), Richard Millsap (drums) and Ryan Bowman (bass). One can hardly wait how the success-story of this Texan band will go on. For those who love the band's roots-rock should NOT miss a live show! It's worth to attend!